Widespread and variable. Western and eastern populations were once considered separate species but have been found to hybridize. Western: Upperside of male dull red-brown, female tawny; both with dark brown costa and wing borders. Underside of forewing rust-red; hindwing dull to bright green with irregular white line edged inwardly with red-brown. 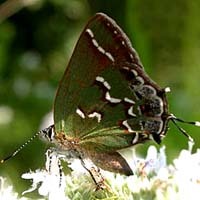 Eastern: Upperside of male dark brown with olive-colored sheen, female blackish brown. Underside green; forewing with tawny base, hindwing with 2 white spots near base and irregular white line edged inwardly with red-brown.